Tesla CEO Elon Musk was all smiles on Tuesday's first day of trading. The stock fell the next 3 days, leaving the week's gain at 13 percent. NEW YORK (Bloomberg) – Shares of Tesla Motors Inc., the first U.S. automaker to complete an initial public offering in more than a half century, retreated for the third straight day to trim the gain for its first week of trading to 13 percent. 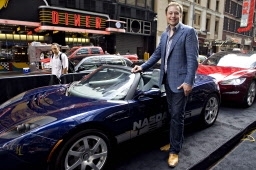 The maker of the $109,000 electric Roadster slid 13 percent on Friday to $19.20 in Nasdaq Stock Market trading. The Palo Alto, California-based company had rallied 41 percent on June 29 after selling shares above the forecast price range for its $260 million offering. The IPO was the first by an American car company since Ford Motor Co. in 1956. CEO Elon Musk, who has staked his personal fortune to Tesla after making almost $300 million selling PayPal Inc. and Zip2 Corp., is using the offering to fund a startup that expects to lose more money in the next two years as it tries to build a battery-powered sedan. The automaker, which has a market capitalization of $1.79 billion, sold 15.3 million shares at $17 each after an overallotment option was exercised, according to filings with the Securities and Exchange Commission. The company will use proceeds for factories and possible acquisitions. Tesla rallied on its first day even as the Standard & Poor's 500 Index tumbled 3.1 percent on concern over weakening growth in China and lower-than-estimated U.S. consumer confidence. The sale also came after at least 35 companies worldwide postponed or withdrew IPOs since the start of May as the European debt crisis sent the S&P 500 down as much as 14 percent from its 2010 high. Electric-car technology has been supported by U.S. policy makers including President Barack Obama as a way to reduce the nation's oil use and dependence on foreign energy sources. Obama set a goal of getting 1 million plug-in hybrids and electric cars on U.S. roads by 2015 and subsidized Tesla with a $465 million loan from the Department of Energy to develop its cars. Musk, Tesla's biggest shareholder, co-founded PayPal, the online payment company, and is CEO of Space Exploration Technologies Inc., a California company that builds spacecraft. Tesla's net loss in the first quarter almost doubled to $29.5 million from a year earlier. The deficit is more than half the $55.7 million the carmaker lost in all of 2009. At the original midpoint price of $15, Tesla was valued at 5.5 times its net tangible assets, a measure of shareholder equity that excludes assets that can't be sold in liquidation. That's triple the median 1.82 times for automotive companies globally, data compiled by Bloomberg show. Tesla will use the IPO and the federal loan to develop its lithium-ion battery-powered Model S, a $57,400 electric sedan intended to travel 160 miles (257 kilometers) per charge, by 2012. The company plans to produce at least 20,000 units of the Model S each year. As Tesla focuses on creating a niche for premium-priced electric vehicles, Nissan Motor Co. and General Motors Co. are developing battery-powered vehicles to appeal to mainstream buyers. Nissan's electric Leaf hatchback, which has a range of 100 miles, goes on sale in the United States later this year with a base price of $32,780, or a third that of Tesla's Roadster. GM plans to introduce the Chevrolet Volt electric car this fall.